The purpose of this project is to improve vehicular access to and from the City of Alameda and I-880. Access to and from Alameda must go through Oakland Chinatown, which has significantly high pedestrian volumes and elderly population. The pedestrian and vehicular conflict made several Oakland Chinatown core intersections the highest collision rate in Oakland. It is not only the major concern in this community, but also a major obstacle to forge consensus to improve access to and from Alameda. The project had been studied four times since 2000, but failed to accomplish a consensus. Alameda CTC in 2017 made its 5th attempt to move this project to the PAED phase. CHS Consulting Group has been involved in this project over the past 20 years. The current effort resurrected a detailed geometric and safety study of an option preferred by Oakland Chinatown community leaders, but deemed unfeasible previously. CHS was responsible for a detailed traffic operations/simulation analysis for this project that covers 56 intersections in both the Cities of Oakland and Alameda. 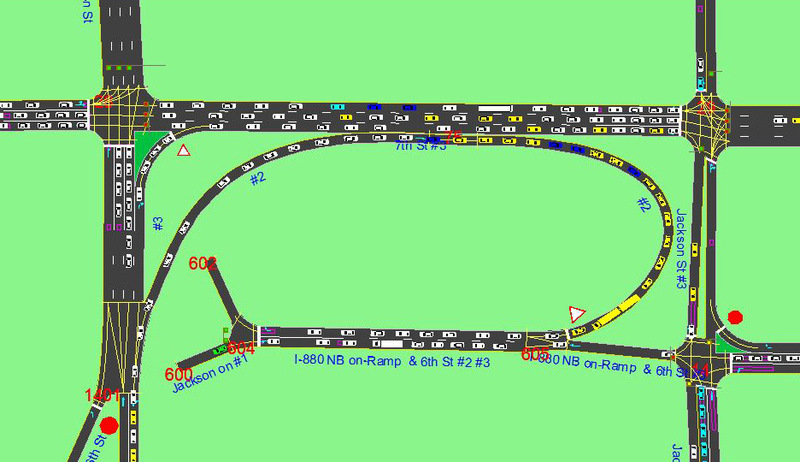 The signal analysis required detailed SimTraffic validation and calibration of vehicle queue length and durations, especially the Jason Street on-ramp to I-880. The project also involves future traffic operations analysis for years 2025 and 2045 with and without the proposed improvements. CHS analyses were accepted by Alameda CTC and Caltrans and the project is now moving forward to 65% design. ©2018 CHS Consulting Group. All rights reserved.